Student centres are going under a review and students could see some of their favourite services changed. Ever go to the Peer Support’s free breakfast? Do you indulge yourself in learning of native culture and discussing such things with like-minded individuals? Perhaps you simply like a place to relax and feel accepted? The services have been more than accomodating, providing support for students in a number of ways, for example financially with textbook loans, opportunities to meet with groups like Peer Support, the Pride Centre and the Native Student Centre. But, in the near future that might change. 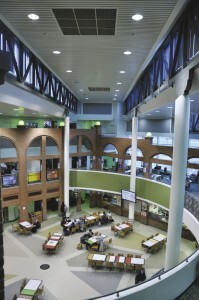 Starting with a review process that resulted in the Sustainability Centre turning into the Centre for Student Initiative (CSI), the remaining student centres in Wyckham might undergo a transformation based on students “voting with their feet”, according to the director of Student Services at the Students’ Association, Shereen Samuels. “First of all, it’s important to understand that we are constantly re-evaluating our services. An example of that is last year, when the sustainability centre morphed into the CSI and made it more effective and vibrant,” Samuels said. Depending on how often students use a centre, what services they make use of and how the services that those centres provide are received, an appropriate change may occur. Students who enjoy the centres and don’t want to see changes occur are encouraged to utilize the spaces since the centres will be judged on how much traction they get. Centres that students are actively using most likely to stay the same in the future.